Todd Agosto spent more than a year building the Jackson Bark dog agility course out of scraps abandoned by construction crews. SOUTH SHORE — At an over-capacity meeting on changes coming to Jackson Park, new details showed the South Side's only dog park would likely be eliminated to make way for a larger driving range for the golf course. The Chicago Park District is extending its initial run of public meetings on changes to Jackson Park after more than 230 people showed up for a meeting that could only accommodate 75. About 160 people were turned away from Tuesday night’s meeting at La Rabida Children’s Hospital that was to be the third and final meeting on how the Obama Presidential Center, several road closures and the combining of the South Shore and Jackson Park golf courses would work. Fifth Ward Ald. 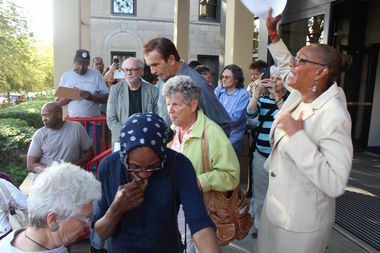 Leslie Hairston promised 160 people turned away from a Tuesday meeting on changes to Jackson Park that a makeup meeting would be scheduled that could accommodate everyone. Fifth Ward Ald. Leslie Hairston stood on the front steps of the hospital at 6501 S. Promotory Drive, promising a fourth meeting in the next two weeks as people asked her to move the meeting outside into the parking lot so everyone could participate. “I would bring them out here, but they have a PowerPoint presentation, and there is no electricity out here,” Hairston said. Inside, the select people who did get in saw a few new details about the plans. 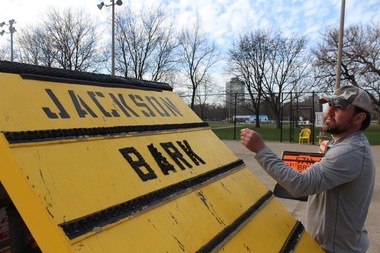 Among the changes was the elimination of the only dog park on the South Side, an unofficial and ad hoc dog agility course called Jackson Bark built over the last two years on a unused tennis court on the northern edge of the driving range. The 10 tennis courts would be removed to extend the driving range to 300 yards. Another nine courts would be removed from Cornell and Hayes drives to make way for a new golf clubhouse. The dog park is “much loved and much needed,” said Margaret Schmid of Jackson Park Watch, a group that has been critical of the planning for Jackson Park. Hairston said the park is not large enough to have all the features people want. Dog lovers and tennis players would seem to be those pushed out in the current iteration of the golf course expansion. Louise McCurry, president of the Jackson Park Advisory Council, said after the meeting that the tennis courts are lightly used, the park has other courts, and she’s been assured by Chicago Park District officials that the dog park will be moved elsewhere in the park and made the first official dog park on the South Side. No plans for a dog park have been presented at community meetings. Hairston said current plans are just proposals and other options are being considered. Golf course planners said there are some ground rules built into the process as it moves forward. Brian Hogan of the Chicago Golf Alliance said the golf course designers are committed to maintaining the current mix of nature areas and golf links at the South Shore Cultural Center, 7059 S. South Shore Drive. After the first meeting June 22 showing the layout of the new golf course for the first time, South Shore residents expressed concern that a nature preserve would be replaced with the 12th hole of the golf course at the cultural center. Hogan said the butterfly area would remain where it is, but the peninsula with views of the skyline would be given over to golfers, with more nature areas added north of the cultural center between two golf holes away from the lakeshore. He said golf course would not add any fences, allowing the natural areas of the golf course to remain open to picnickers and runners. It’s still unclear how those groups would safely mix with golfers. Those questions and others are expected to be answered during the development of the plan meant to guide all of these developments. The report is not expected to be released until October, but planning of the Obama Presidential Center is expected to be mostly done in November. The city approval process and work on the golf course was supposed to have started in March. The extra meeting is expected to be sometime in early July.